Many of you or your friends and relatives tried to give up smoking. Witty Mark Twain said the following on the subject: “Giving up smoking is the easiest thing in the world. I know because I’ve done it thousands of times”. Life shows that it is easier not to start smoking at all than to give it up. And those who really have given up smoking, enjoy sincere respect of friends and colleagues. However 20 years ago Jacob Hiller has developed such nicotine addiction treatment method that could help to give up smoking forever within a couple of hours not only Mark Twain, but each of you. The unique Nicotine Addiction Treatment method is based on administration of anticholinergic preparations. Anticholinergic medicines form a large group of medicines applied against acetylcholine. Acetylcholine accumulation in the smoker’s nervous system is the cause of withdrawal syndrome occurrence. We cure nicotine addiction at any stage using state-of-art means, preparations and medicines using Doctor Hiller’s method. We offer to get acquainted with treatment principle explanation by visual demonstration. The physical addiction expressed as irritation, stress, lack of concentration is completely eliminated using anticholinergic preparation. Nicotine is one of 2000 substances contained in a cigarette and getting into human lungs upon smoking. Nicotine causes the discharge of calming substances in the brain: gamma-aminobutyrate acid, dopamine and endorphin (biological natural morphine generated by the human brain). Endorphin is discharged in humans during physical and psychological stress and assists in dealing with difficulties. A smoker gets used to endorphin dose permanently increasing with nicotine and smokes again in order to support dopamine and endorphin level. Many people smoking for many years have to get up 2-3 times during the night to smoke otherwise they cannot sleep. After a short period of nicotine absence the smokers become irritated and are not able to concentrate and have other abstinence symptoms. But real physical dependence is connected with acetylcholine (one of the basic brain neurotransmitters). Neurotransmitter is a substance transferring information between the brain cells. There is a balance between the nervous system functioning on adrenalin and similar substances and opposite system functioning on acetylcholine. Acetylcholine is a neurotransmitter that plays an important role in adrenalin balance. Explanatory note to Figure 1. Muscarinic synapses in the parasympathetic nervous system. Mediator is a substance transferring information, i.e. acetylcholine. Acetylcholine transfers information between nerve endings. 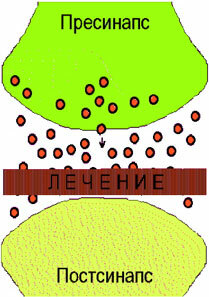 Synapse is a junction of two nerve endings. Acetylcholine is a mediator, substance transferring information. It transmits information between nerve endings. 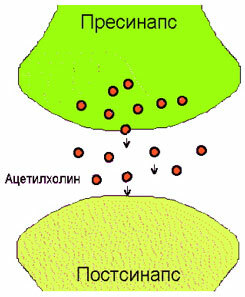 Synapse is a junction of two nerve endings. 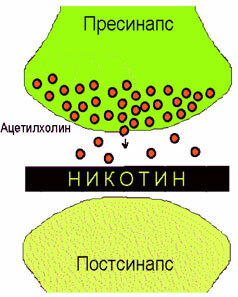 Nicotine effectively blocks the acetylcholine discharge and, as a result, the acetylcholine quantity in nerve junctions (synapses) is increased. If a smoker does not smoke the next cigarette “in time”, the nicotine blockade in nerve junctions is reduced (see Figures 2,3) and a large quantity of acetylcholine is transferred between nerve endings. Explanatory note to Figure 2. Nicotine blocks transmission of parasympathetic nervous system impulse. And this blockade results in accumulation of great quantity of acetylcholine in nerve presynapses. Explanatory note to Figure 3. Upon smoking cessation, nicotine stops blocking acetylcholine discharge. As a result a great quantity of acetylcholine is discharged in nerve endings, and it results in abstinence symptoms. The increased acetylcholine quantity causes additional nervousness, tremor of hands, abdominal pains and cardiac rhythm disturbance. 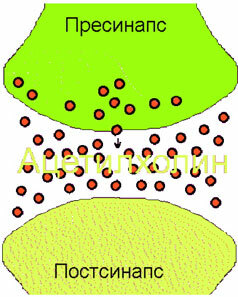 The combination of endorphin absence symptoms and increase in acetylcholine quantity represents the abstinence picture. 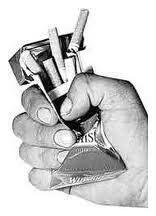 Physical abstinence of smokers lasts for up to 3 days. Nicotine addiction treatment according to Doctor Hiller’s method includes the injection of three anticholinergic medicines (anticholinergic group consists of substances which block acetylcholine in nerve endings as nicotine). But these substances do not contain nicotine and do not resemble it by structure (see Figure 4). Explanatory note to Figure 4. Upon Doctor Hiller’s treatment the medicines that do not contain nicotine, making nicotine-like blockade in synapses and, as a result, preventing abstinence are administered. Immediately after nicotine smoking treatment a patient does not need a cigarette, since a physical dependency and abstinence are completely removed. Only a habit is left. In order to overcome it a person is provided with special recommendations of doctors. After such nicotine smoking treatment a patient feels fatigue and foul taste in the mouth. It is not recommended to drive a car within the next 3-4 hours. The only contraindication to such treatment is high intraocular pressure (glaucoma). Usually it is manifested in elderly people over 60 years old. The scientific research according to Doctor Hiller’s method was carried out in respect of hundreds of patients in Italy, Israel and Switzerland 20 years ago. Based on high-performance results of such scientific research Doctor Hiller, in cooperation with huge American company, registered his method in a form of international patent valid in 122 world countries. This nicotine smoking treatment method is applied in the best European medical centers including St. Raphael hospital in Italy. Click here to look through the document notifying the purchase of Doctor Jacob Hiller’s patents through the major NASDAQ auction exchange by American firm HYTHIAM. For additional documentation click here – HYTHIAM Hiller.